Because showing you 3 meals and 2 snacks just feels incomplete today. Not enough. Happy What I Ate Wednesday people! 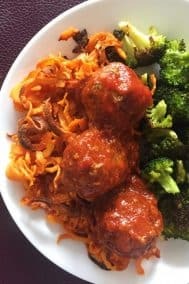 It’s time to start the party, and, today I’m going to show and tell you about my current (like past 3 days) favorites in the paleo-running-momma-sphere. Ever notice that your meals ever-so-slightly change each week? Could be the same ingredients rearranged or whatever, but still, we all have our “food combos of the week” that we just can’t get enough of until we run out and go back to the store and pick something new. Preferably something new that’s also on sale. Thanks so much Jenn for hosting this link-up! Now, let me tell you a story about all the good stuff I had the pleasure to *feast upon recently. *I went to Thesaurus.com to find a synonym for “eaten.” Highly recommend you check out some of these. Aren’t you glad I didn’t choose gormandize? If I thought it was perfectly acceptable to eat the same thing 3 times per day, I’d probably make myself breakfast 3 times per day. Secretly I sometimes do this, uhh maybe not 3 times but twice. So now you know. You already know I like eggs so I won’t even get into that. 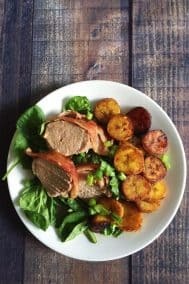 One combo I’ve been digging a lot lately is bacon cooked with parsnips and plantains. I think I had some leftover parsnips and plantains one day and randomly combined them and didn’t look back. I’ve been frying them up in hashes together and also roasting into fries. I could eat them together all the time, at least this week. My lunches lately are one of 2 combos – spinach topped with a burger (bacon with this, but not always) tomatoes, kalamata olives and homemade mayo. Salt + fat = good stuff! If I’m craving something more carby I’ve been topping my spinach with fried plantains and pre-cooked sausage, usually Aidells brand. I buy the chicken-apple or the pork Andouille. I throw some avocado in too and holy yum – easy too. My afternoon snacks are all over the place. If we have a leftover treat I am all over that. Since paleo treats tend to be very high in fat I don’t find that my energy dips even if there’s a decent amount of sugar in it. For the past few days I’ve been eating something chocolate since we had both double chocolate cupcakes and a gooey chocolate brownie pie. With V-day almost here I don’t see the chocolate phase ending until at least next week! I still love GT’s kombucha and have been drinking the ginger and citrus flavors pretty often. I seriously love this stuff, it’s so good that I question if there are addictive properties in there! You know when your (young and picky) kid likes something healthy and you get so excited and make it constantly? That’s what’s happened for us and baked sweet potato fries. My son loves them so much and I just can’t NOT make them! When I roast white potatoes or plantains I still roast him some sweet potato fries. I’m really hoping I’m not on a slippery slope back to “kid dinners” but I can’t say no to his sweet potato love. I’m right there with him so I can’t complain at all. Meat and sweet potatoes for the winning combo here. Some favorite meat dishes are burgers, boneless skinless chicken thighs, and ribeye steaks. We don’t eat steak often, but no one complains when we do. 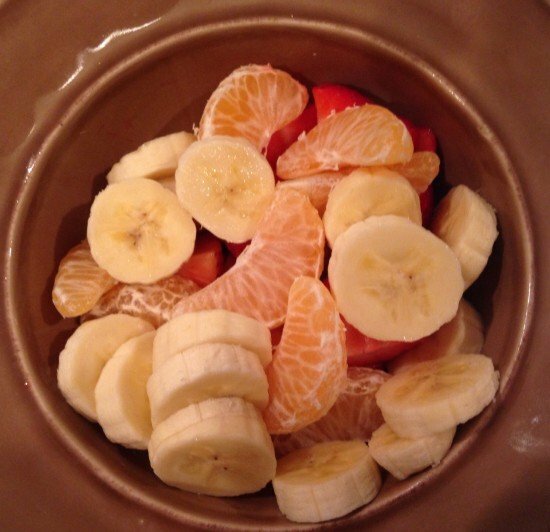 I’ve been eating the same fruit combo before bed for a few days: sliced bananas, strawberries, and clementines. I’ve never been big on citrus fruits but with all the germs we’ve had I figured I’d go for some oranges. Turns out they’re better than I remember so I’m sticking with it! 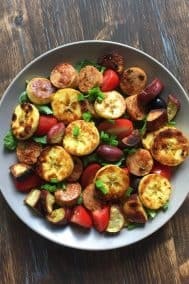 What are your current favorite meal/snack combos? My usual go-to food combo is peanut butter and chocolate chips but hey, I’ll gormandize bacon with anything! And seriously, there’s just something so crazy good about fried eggs. Still laughing at gormandize 🙂 Everything you said, just yum! I’ve been loving creating different breakfast combos but Im not as good at changing things up for lunch and dinner. I ate a clementine for the first time in a while last weekend and I forgot how good they are! I might need to buy some for next week. I’m going to be buying them for a few more weeks. Really forgot how good and easy they are! I have my own same foods in always eating too. I just seem to mix them in different ways to seem like I’m not. Make sense? Probably not. Take breakfast as an example. I usually eat the same one everyday. Random thought. I cannot eat spinach salad. Something about the stems really creep me out. Hehe I love your insights into the world of being a parents, it gets me thinking about someday……right now I can only imagine. Funny you said about salad and beef, I love that combo, and we have lots of beef left from dinner, so i can’t wait to have that in a salad later this week! If I could eat breakfast for every meal I would! Lots of times I do eat the same breakfast foods for breakfast and lunch but usually by dinner I am in the mood for savory so even if oatmeal for dinner sounds nice at 9 am, it never happens. GT’s Kombucha is totally addictive- Whole Foods had a sale last month so I tried a bunch of flavors out but my favorite was still my Ginger and gingerberry- so delicious!! Getting so excited thinking about it being on sale! Seems to never happen but maybe I should track it more closely. i started eating full fat yogurt again because i had a serious craving, i’ve been adding flax and dried berries and some other seeds. it’s hitting the spot for now but i think i’m not into yogurt as much as i thought. i’ve never been into it, but always ‘think’ it’s a good idea. does that make sense? oh well, it was good on sunday when i was actually craving it! now i’m just sort of stubbornly picking at it.. 😀 happy wednesday Michele!!! Give that boy all the sweet potatoes her wants! When ever I don’t know what I want to top my chicken with, I always just go with tahini! Such a perfect savory nutty combo! Haha I know that’s my exact thought. Not too many kids asking for SP so I’m going with it! I need to get on some tahini. I love getting ideas from other people’s go-tos! Chocolate’s been pretty popular around these parts as well, and I think I’m okay with that 😉 And I actually have a lot of days where I end up eating breakfast foods more than once. It’s my favourite meal of the day and I figure that if I force myself to eat something else, I’ll just end up unsatisfied. So oatmeal for dinner it is. The chocolate hasn’t ended! I had to make my valentines candy recipe 3 times to get it right. My kids were happy but I think I’ll be done with chocolate now for a while! I love that so many of us just want breakfast all the time! A bunch of morning people trying to recreate that happy morning feeling all day! 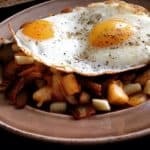 I can eat an egg ANY TIME of the DAY. Period. New research from American Heart Assn says you can eat two a day without it affecting weight, cholesterol, anything. So good for you. I eat nowhere near 14 a week, so figure if I eat three or four some days and none others, it all evens out. So funny on clementines. I buy 2-3 5 lb bags a WEEK. Seriously. My kids each eat 3 or 4 a day. So easy to peel, seedless. Perfect kid food. They are so sad when the season is over. I, however, only eat a couple a week. Guess I prefer an apple. Your cupcakes were a big hit, but next time I may save myself some work and just go for making mini-chocolates with the icing. That was pure AWESOMENESS! I think I eat more than 14 a week! I just love them and how I feel when I eat them too. The clementines are great for everyone in the family, and the easy peeling is a HUGE plus! Glad you liked the cupcakes! AND I’m posting a chocolate candy recipe tomorrow that involves something very similar and really easy! Your breakfast looks SO good. is say yes, that breakfast is good anytime anywhere! the best! and GT! No shame in repeat meals- Especially when they look so good! I saw the dinner picture on instagram and was salivating!